Dior presents a collection VIII Grand Bal Beverly Hills SE. 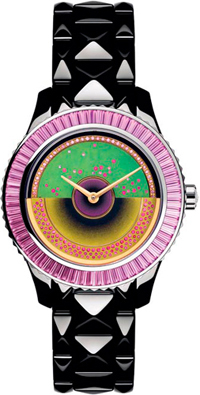 Magnificent watches Dior haute was started in 1975. In honor of the opening of another boutique in Beverly Hills company has developed new products Dior, Dior VIII Grand Bal. Hours are collected on the basis of the mechanism of Dior Inverse, which was established recently. New caliber has flipped the rotor, which is placed directly on the watch dial. All new items from this collection are encrusted with various jewels, feathers and other details that give the appearance of the original clock. Most new products in this line are made in bright colors, however, the model Dior VII Grand Bal Beverly Hills distinctive in design. It shows the love of the brand to the simplicity and purity of white. The model was released in a single copy, has a ceramic bracelet with typical units in the form of pyramids. The round watch case diameter of 38 mm is made of white gold and set with diamonds bezel. 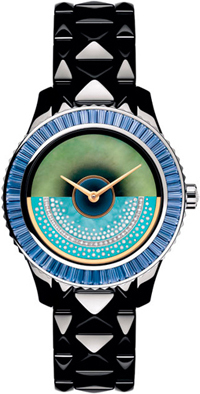 Mother of pearl dial set with inverted rotor in 18-carat gold. Back cover made of opal glass, decorated with engraved “1/1”.